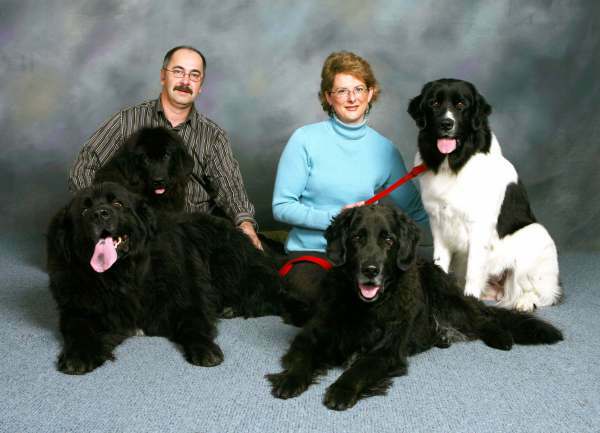 Our love story with the Newfoundland dog started… with a mixed breed! Huey came into our lives in 1996 and, although he was generally recognized as a retriever X, it rapidly became very clear to us that a Newf or two had found their way into his lineage. We quickly decided that we had to add a Newf to our family. After much research and waiting almost a year, Twin arrived. We fell in love head over heel. After a few more dogs, some health issues, unsuccessful breedings, hopes and joys, we had a fresh start and welcomed our “4 Freedom” litter. Health, temperament and soundness are our utmost priorities when deciding on a breeding. We strive to preserve and enhance the true nature and purpose of the Newfoundland: a versatile dog, as comfortable in the show and obedience ring as he can be doing water or draft work. As our beloved pets, our dogs live with us, in our home. Our puppies are born and raised in the house. Our life revolves around our dogs and we wouldn’t have it any other way!